So yeah, I freaking adore almond butter. My uncle always told me that when I was really little, I would always shout out “I love it, I love it, I love it!” before I finished opening up my birthday presents. I wouldn’t even know what it was yet, but I knew it was an exciting box wrapped with even more exciting wrapping paper. Even if it was a bright orange sock wrapped with string, I knew I’d love it. A present is a present, right? Now I’m all grown up and though I don’t still shout those words when opening presents, I often think them when I’m eating almond butter. Lately I’ve been going crazy for it smeared on my all time favorite cinnamon raisin toast. Or just normal toast with cinnamon and sliced bananas. I love it in Greek yogurt with 100% fruit strawberry jelly. I love it in snickerdoodle smoothies. But this is no shocker. I mean I wrote a whole post about my almond butter obsession. So you can imagine my utter dismay when I went to Trader Joe’s multiple times to find nothing but empty shelves of my beloved raw creamy almond butter. After another unsuccessful attempt to restock my raw almond butter supply at Whole Foods, I ran home and googled “almond butter shortage.” I was dying to know what was keeping me from my almond butter. I’m sure lots of you are wondering the same thing, too! I mean a life without almond butter is like a life without clothing, food and shelter. I need it to survive! WHO ATE ALL THE ALMOND BUTTER??!? It turns out that a nationwide shortage of honeybees is what’s causing the global almond shortage. Click here to read the article. I thought this part was pretty funny: “It looks like we’ve promoted almonds to the point where we need to start promoting bees,” said Mike Mason, a member of the board of directors for the Almond Board of California, a trade group. Anyway, what’s a girl to do when there’s no almond butter to be found? 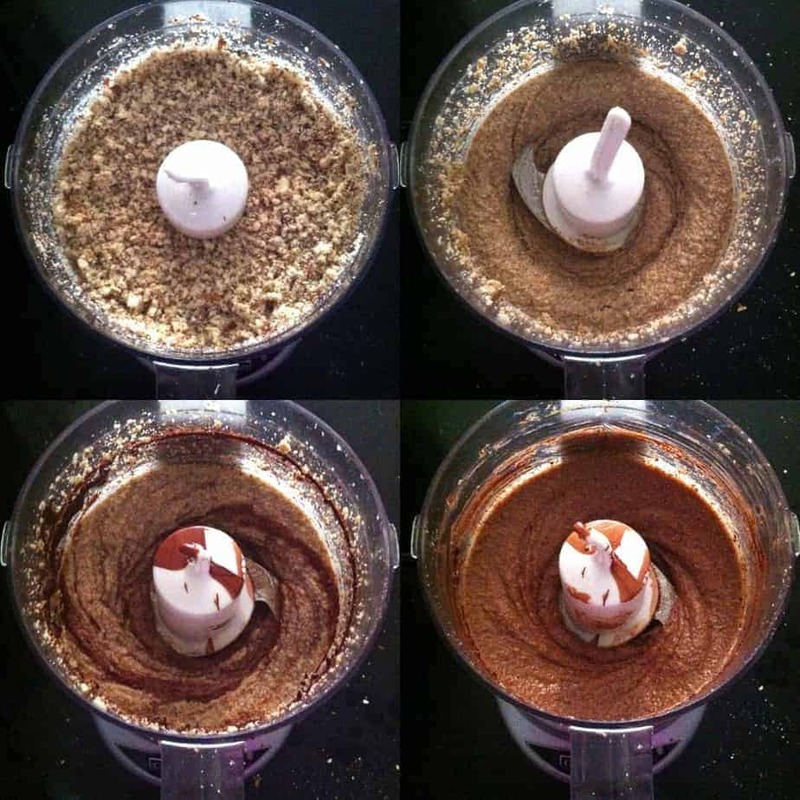 Whip out the food processor and make your own! It’s super easy. I bought a bag full of raw almonds in the bulk bins at Whole Foods. If you prefer the roasted kind, you could always buy roasted almonds. Dump them in the food processor and blend them for about 15 minutes, scraping down the sides every couple minutes. It takes quite a while and you may be scared that your food processor is going to blow up, but I promise it won’t. I don’t like to add any salt, sugar or oil because I like the pure raw flavor, but I had a ridiculous amount of super dark chocolate, so I melted a couple squares of that toward the end and tossed it in in the last couple minutes. If you like it sweeter, add a tablespoon of pure maple syrup and a pinch of salt. Just remember: you’ll think it’s done, but it’s not. The longer it blends, the smoother it’ll get as the almond release their oils. Blend baby, blend! Blend almonds in a food processor for about 10 to 15 minutes, scraping down the sides every couple of minutes. 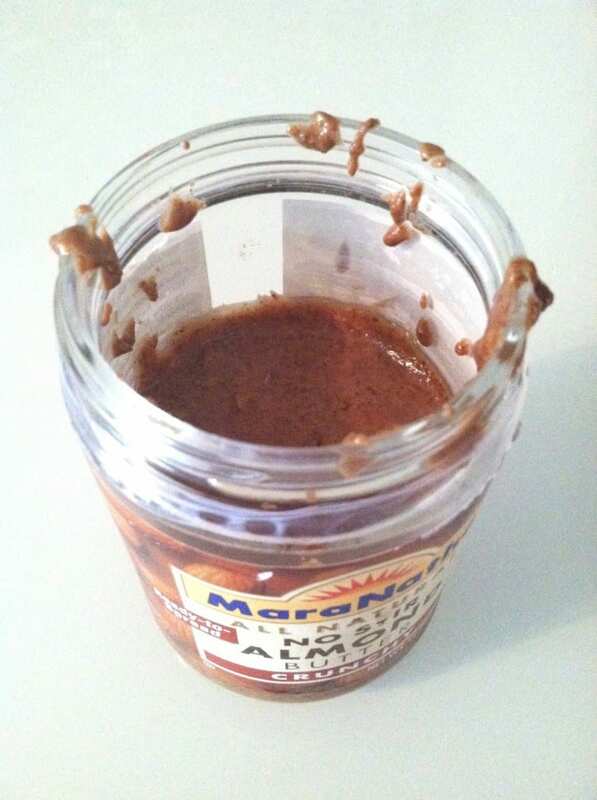 When almond butter looks smooth and creamy, pause and melt the chocolate in the microwave in thirty-second intervals. Once melted, add to food processor. Blend for a minute more or until it’s all mixed in. Sweeten with pure maple syrup (about a tablespoon) to taste, if you’d like. Here are a few more delicious looking homemade almond butter recipes! I REALLY need to try making my own almond butter!! And adding chocolate to it? Yum!! save me a bite? 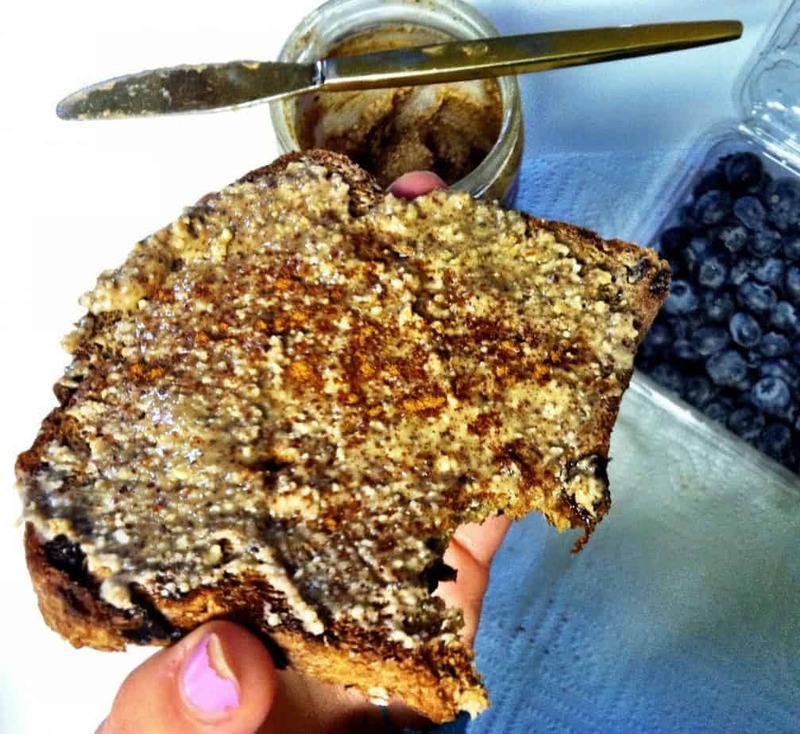 i feel like i wrote this post myself… i miss my raw almond butter!! OMG great idea to dip frozen nanners in it! That sounds fabulous. This almond butter sounds amazing! I’ve never made it before, but it sounds super easy to do. I really need to try it out! I love the addition of chocolate…yum! I got my mini cuisinart for $40 at Macy’s. So worth it..I use it all the time! It is hiiiigh time I make almond butter! I love it too and have only tried store-bought. I love your dark chocolate rendition and am definitely going to to be making this! I can replace my bad habit of spoon-feeding myself peanut butter with homemade almond butter. No shame in that!! I was all about the store bought until I was forced to make my own!! No shame in spoon feeding this deliciousness, either! 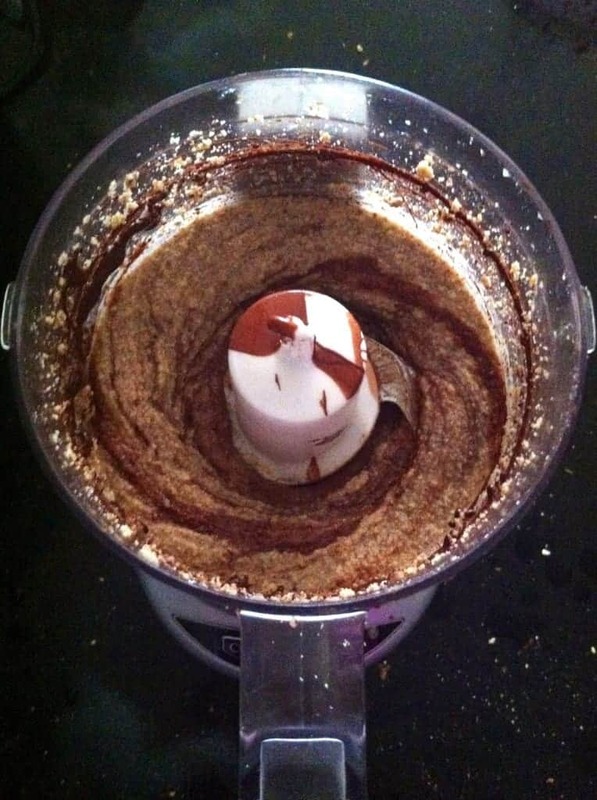 the homemade version always tastes so much better… i love almond butter, never added chocolate to it. Try adding dark chocolate! It’s SO good for dessert on toast with extra chocolate chips. I freaking love chocolate-coated almonds…but chocolate whizzed with almonds and then slathered on bread?? SIGN ME UP! OMG chocolate coated almonds with sea salt….I die. Ironically I found a jar of raw almond butter at Trader Joe’s the day after I post this. OF COURSE. All I can say is YUM! Almonds are fantastic and any way you can incorporate them and dark chocolate is a definite win : ) Thanks for sharing! Glad you agree, Brienna! Whenever I can add some dark chocolate, you better believe I’m gonna!